A powerful full spectrum 18 Watt plant light suitable for any indoor usage where extra light is needed but can just as well be used for growing herbs and smaller fruiting plants such as chili. It is passively cooled any has no internal fans or other mechanisms that are noisy- a must for anyone using it where demand on comfort is high. 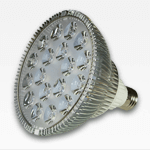 This light has been produced with our optimized full spectrum ratio and is suitable for all types of plants and can be used during any stage of plant growth. Its suitable for usage all year as support for plants that do not get enough sun light and can be used for wintering plants. The spectrum we have developed is optimized for all vital plant pigments and suitable for both vegetative and flowering phases. This is not a purely red and blue spectrum light usually sold for plants, merely optimized for chlorophyll production but instead uses a selection of several different wavelengths to aid production of not only chlorophyll but also Anthocyanin, flavonoids and carotene. We utilize our wavelengths with a ratio that produces a full spectrum white light which in contrast to many of our competitors mean our lights can be used indoors where the demand for aesthetics is high. Thanks to our full spectrum all plant colors are well defined and reflected. Using LED for growing and maintaining plants is as mentioned above advantageous as the spectrum can be adjusted in a much more precise manner compared to for example fluorescent or HPS lighting. Not only does this result in a more precise spectrum but it directly affects how much energy is needed to run the light. Why spend up to a third of your electricity on visible wavelengths that are not fully optimized or in the case of HPS/MH where more of the energy is turned into heat than actual light.